Here is a quick guide on how to make filebot manually scan for files that were not automatically extracted so that they can be recognized in Plex library. If you are using Windows OS you need to install and setup PuTTY before you continue on. When you are typing out the name of the directory press TAB button on your keyboard and it should autofill the rest of name for you. 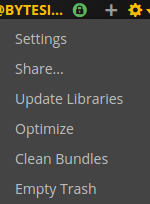 After filebot is finished it´s recommended to update your Plex library.